Early Settlement and Mexican War. Texas Jews in Army and Navy. Largest state in the American Union; admitted in 1845; seceded Feb. 1, 1861; and readmitted in 1870. Previous to its admission to the Union, Texas was an independent republic (1836-45). Samuel Isaacs removed from the United States to Texas in 1821, with Austin's first colonists. For serving in the army of the Republic of Texas he was given 320 acres of land. When Abraham Cohen Labatt visited Texas in 1831, he found at Velasco Jacob Henry and Jacob Lyons, of England and Charleston, S, C., respectively, engaged in mercantile pursuits. Jacob Henry's will provided for the building of a hospital at Velasco. Nacogdoches seems to have been the center of immigration. Prominent settlers (1832-40) were Adolphus Sterne, who participated in the Fredonian war, subsequently acting as alcalde and official interpreter; Dr. Joseph Hertz and his brother Hyman, Simon Schloss, Albert Emanuel, Sam. Maas (who married a sister of Offenbach, the composer), and Simon Weiss. They were pioneers in mercantile enterprises, and served the government in civil and military capacities. Simon and Jacob Mussina settled in Galveston (1836), the former editing a paper and practising law. Edward J. Johnson, from Cincinnati, Ohio, was killed while fighting under Fannin at Goliad (1836), where three other Jews also fought—Benjamin H. Mordecai (killed by Indians in 1840), M. K. Moses, and Herman Ehrenberg. Notable services were rendered to Texas by Levi Charles Harby (sometimes known as Levi Myers Harby), Isadore Dyer, and Leon Dyer. Michael Seeligson settled in Galveston in 1836; he was alderman of the city in 1840 and 1848, mayor in 1853, and worked untiringly for the annexation of the Republic of Texas to the United States. Henry Seeligson, his son, went to Galveston from Michigan in 1839, held several military appointments, and fought in three wars, in one of which he was highly complimented by Gen. Zachary Taylor. Prominent in the early wars, from San Jacinto (1835) to the war with Mexico (1846), were: Eugene Joseph Chiméne, Kohn (Texasspy-company), Henry Wiener, Moses Albert Levy (surgeon-general in Sam. Houston's army in the Texas-Mexican war; was present at the storming of the Alamo, Dec. 5, 1835), A. Wolf (killed in the Alamo, 1836; his name is inscribed on the Alamo monument at Austin), Dr. Isaac Lyons of Charleston (surgeon-general, 1836), and D. I. Kokernot. Michael de Young, a French Jew, settled in San Augustine in 1840, and furnished the necessary equipment to volunteers during the war with Mexico. Three years earlier Edward S. Solomon settled in the same town. Many acres of land in Texas, now under cultivation, were originally allotted to David Moses and Michael de Young for services rendered to the republic. Jacob de Cordova (b. Spanish Town, Jamaica, 1808; d. Texas, 1868) removed to Galveston from New Orleans in 1837, and became an expert in real estate; "De Cordova's Land Agency" was known throughout the states. Upon a visit to Jamaica in 1833 he founded the "Daily Gleaner." In 1856 he published at Austin "The Texas Emigrant's and Traveler's Guide-Book," and later "Texas, Her Resources and Her Public Men" (Philadelphia, 1858). De Cordova introduced the Order of Odd Fellows into Texas. In 1847 he represented Harris county in the Texas legislature, and in 1849 he laid out the city of Waco. During 1856-58 he lectured on the resources of Texas in the large cities of the United States and in England. In 1848 his brother Phinehas (b. Philadelphia, 1819; d. 1903), joined him in the establishment of the "Texas Herald," a fortnightly. Phinehas subsequently edited in Austin the "South-Western American," a weekly (1849-52), which successfully advocated the loaning of the school-fund and the donating of a portion of the public lands to aid the building of railroads. Emigration to Texas found an active advocate in Henry Castro (b. France, 1786; d. Mexico, 1861). In 1842 Castro entered into a contract with Sam. Houston, President of the Republic of Texas, to settle a colony west of the Medina, and Houston appointed him consul-general in France for Texas. Between 1843 and 1846 Castro sent to Texas 5,000 emigrants from the Rhenish provinces—the first organized emigration to Texas from a foreign country; considering the unsettled state of the country, it was a masterly undertaking. These emigrants settled in the towns of Castroville and Quihi (1845), Vandenburg (1846), and D'Hanis (1847). Castro county, in northwest Texas, was named in honor of this intrepid Jew, who sank $150,000 of his personal estate in the venture. Castro published pamphlets and maps in French and German to facilitate his emigration scheme. The Jewish settlers in each district began communal life by establishing first a cemetery and then a synagogue. A cemetery was established in Houston in 1844, and a synagogue in 1854; in Galveston, 1852 and 1868 respectively; in San Antonio, 1854 and 1872; in Austin, 1866 and 1876; in Waco, 1869 and 1881; in Dallas, 1872 and 1874. German immigration from the fifties to the seventies was followed by Russian immigration from the eighties to the present time (1905); during the latter period Orthodox synagogues have been erected in all the foregoing cities. Synagogues, cemeteries, and communally active congregations exist in the following towns: Beaumont (synagogue erected 1895), Brenham (1895), Corsicana (1898), El Paso (1898), Fort Worth (Orthodox, 1892; Reform, 1904), Gainesville (1882), Hempstead (1897), Marshall (1886), Palestine (1900), Texarkana (1900), Tyler (1889), Victoria (1894). There are cemeteries in Bonham, Brownsville, Bryan, Calvert, Cleburne, Columbus, Corpus Christi, Denison, Ennis, Greenville, Hallettsville, Henderson, Jefferson, Laredo, Lufkin, Luling, Marlin, Mexia, Mineola, Nacogdoches, Navasota, Orange, Wharton. In these towns services are held on Rosh ha-Shanah and Yom Kippur, and religiousschools have been organized in most of them, largely through the influence of Jeannette Miriam Goldberg Hebrew benevolent associations, ladies' auxiliary and general social societies, and branches of national and international Jewish organizations are widespread; a few Zionists are found in the larger cities. The following towns in addition to those which have been mentioned have from two to ten Jewish families each: Abilene, Alto, Alvarado, Amarillo, Aquilla, Beeville, Bellville, Bremond, Caldwell, Clarksville, Columbia, Crockett, Decatur, Del Rio, Denton, Eagle Lake, Eagle Pass, Elgin, Farmersville, Giddings, Gonzales, Groesbeck, Hearne, Hillsboro, Honey Grove, Jacksonville, Kaufman, Kennedy, Kyle, Lagrange, Llano, Lockhart, Longview, McDade, McKinney, Mount Pleasant, Mount Vernon, Paris, Pittsburg, Richmond, Rio Grande City, Rockdale, Rusk, San Angelo, San Diego, Schulenburg, Sealy, Seguin, Sherman, Skidmore, Sulphur Springs, Taylor, Temple, Terrell, Uvalde, Waelder, Waxahachie, Weatherford, Weimar, Wichita Falls, Willis, Wills' Point, and Yoakum. In the early days, before there was any Jewish communal life, intermarriage between Jews and non-Jews was not uncommon; but to-day throughout the state, although Jew and Gentile mingle freely, intermarriage does not obtain to any appreciable degree. 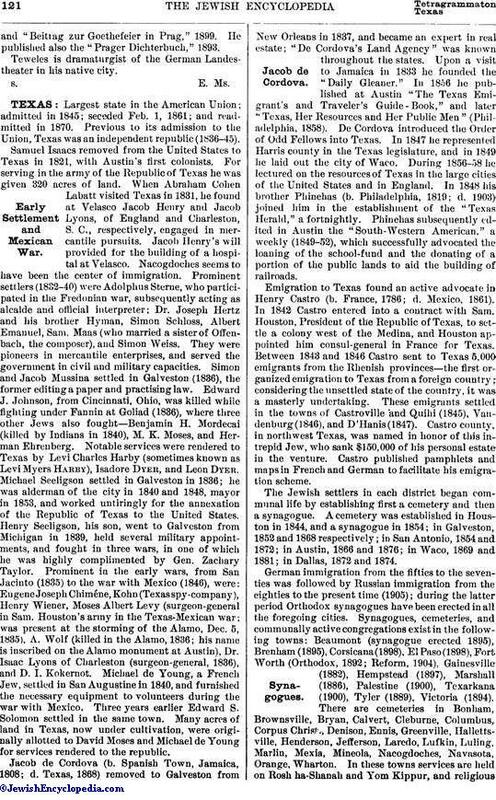 During the Civil war 103 Texas Jews served in the contending armies (Simon Wolf, "The Jew as Patriot, Soldier, and Citizen," p. 424), and the defense of Galveston is inseparably connected with the name of Capt. L. C. Harby (ib. pp. 72 et seq., 116). 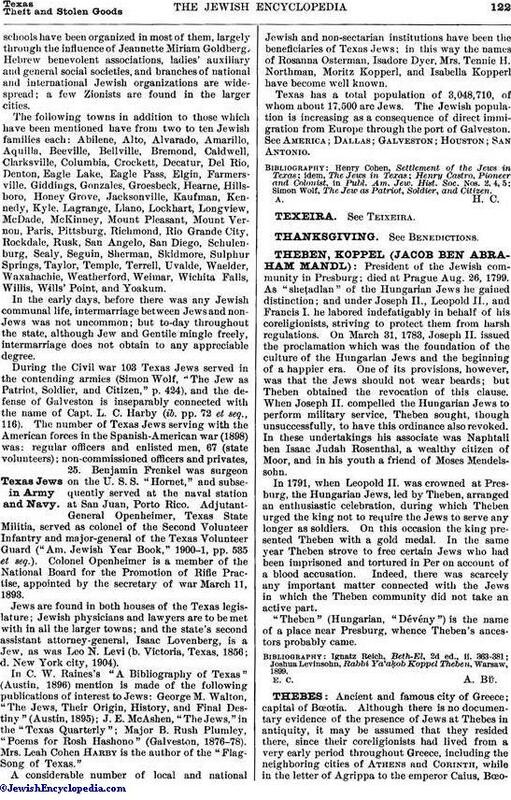 The number of Texas Jews serving with the American forces in the Spanish-American war (1898) was: regular officers and enlisted men, 67 (state volunteers); non-commissioned officers and privates, 25. Benjamin Frenkel was surgeon on the U. S. S. "Hornet," and subsequently served at the naval station at San Juan, Porto Rico. Adjutant-General Openheimer, Texas State Militia, served as colonel of the Second Volunteer Infantry and major-general of the Texas Volunteer Guard ("Am. Jewish Year Book," 1900-1, pp. 535 et seq.). Colonel Openheimer is a member of the National Board for the Promotion of Rifle Practise, appointed by the secretary of war March 11, 1893. Jews are found in both houses of the Texas legislature; Jewish physicians and lawyers are to be met with in all the larger towns; and the state's second assistant attorney-general, Isaac Lovenberg, is a Jew, as was Leo N. Levi (b. Victoria, Texas, 1856; d. New York city, 1904). In C. W. Raines's "A Bibliography of Texas" (Austin, 1896) mention is made of the following publications of interest to Jews: George M. Walton, "The Jews, Their Origin, History, and Final Destiny" (Austin, 1895); J. E. McAshen, "The Jews," in the "Texas Quarterly"; Major B. Rush Plumley, "Poems for Rosh Hashono" (Galveston, 1876-78). Mrs. Leah Cohen Harby is the author of the "Flag-Song of Texas." A considerable number of local and national Jewish and non-sectarian institutions have been the beneficiaries of Texas Jews; in this way the names of Rosanna Osterman, Isadore Dyer, Mrs. Tennie H. Northman, Moritz Kopperl, and Isabella Kopperl have become well known. Texas has a total population of 3,048,710, of whom about 17,500 are Jews. The Jewish population is increasing as a consequence of direct immigration from Europe through the port of Galveston. See America; Dallas; Galveston; Houston; San Antonio. Simon Wolf, The Jew as Patriot, Soldier, and Citizen.